Team Gridcoin on BOINC - October 2018 RAC UpdatesteemCreated with Sketch. Team Gridcoin seems to be coming out of a RAC dip. Here's a quick update with a chart tracking Team Gridcoin's RAC (Recent Average Credit) earned from crunching on BOINC (Berkeley Open Infrastructure for Network Computing). In the last update two weeks ago on October 9th, Team Gridcoin had a computing power on par with the sum of the next 16 teams combined, and that is once again the case. The colorized bands on the chart image track these different sums. 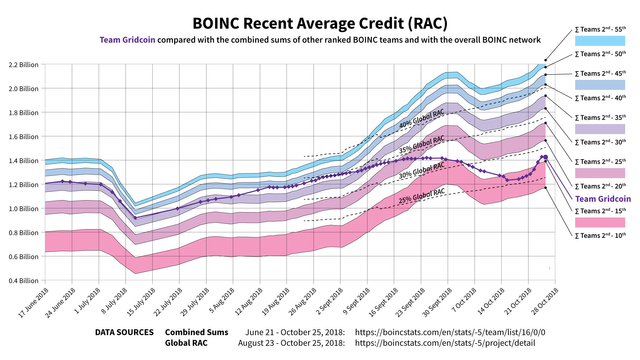 Measuring the total RAC of the entire BOINC network provides us another metric to understand performance; these baselines are shown on the chart image as dashed lines. Team Gridcoin reached a peak last month on September 1st by earning 35.2% of the entire network's RAC. Following a dip bottoming out around October 18th at 25.8%, today (October 25, 2018), Team Gridcoin is back up, standing at 28.1% of the network's total RAC. Congratulations @grwd! You received a personal award!